The results are in! The people have spoken!! And what a way to close out 2016 -- the end of the dreadful Obama era. So many of you participated in HIRA's 12-month long survey to determine which local landmark should be re-named after Obama in honor of his disservice to the nation and to the 'community organizer' industry as a whole. After one full year of voting by real Republicans on HIRA's website and HIRA Action's official Facebook page , conservatives in Hawaii are now ready to pronounce how our 44th president should be honored for the rest of history. Some quick background : HIRA's official Obama survey started back on 30 December 2015 -- during the Obama family's previous (the 7th) multi-million dollar, taxpayer-funded vacation in the islands. Today, New Year's Day 2017, marks the close of our online poll -- the same day that America's favorite family (not!) is leaving town after one final vacation extravaganza on your dime. Before we announce the winning local landmark that you selected for the honor of being called the "Barack Hussein Obama (fill in the blank)", let's quickly highlight a couple of attempts by local Democrat disciples to name something after their political and ideological hero. 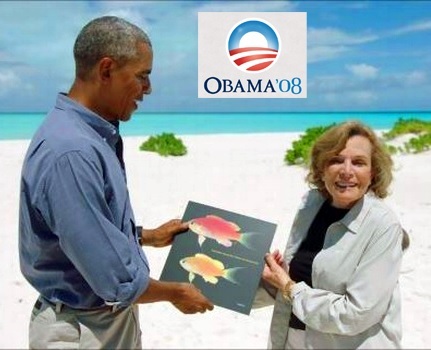 THE OBAMA FISH : More recently, there was the truly pathetic 'fish story ' whereby some Bishop Museum scientists (who were so desperate to have their picture taken with Obama) decided to name a newly-discovered fish after the soon-to-be-ex-president . . . a partisan discovery which will now justify their otherwise dreary scientific careers. Starstruck marine biologist Richard Pyle told National Geographic that even though "we were thinking about naming (the fish) after him anyway," they went the extra mile to ensure their chance to meet Obama during his September trip to Midway. 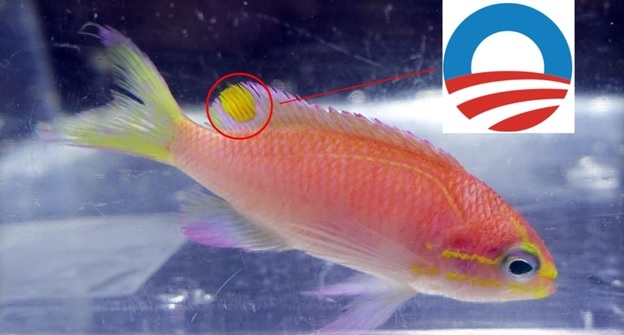 We saw a resemblance (a pretty darn flimsy one) between his campaign logo and the pattern on the fish -- they say the dorsal fin coloration of the male is a circular red spot ringed with blue -- is "very reminiscent of Obama's [campaign] logo." Not really. Pretty lame justification. In fact, you almost gotta feel sorry for a fish named after the worst president the world has ever seen. CALL TO ACTION : So, you see, that's precisely why Hawaii's Republicans needed to step up and responsibly show in Obama's waning days that we have the vision to name something appropriate in Hawaii after the 'local boy' whose lasting legacy will be felt at our borders, at the IRS, in Syria, in healthcare premiums, at a new library in Chicago, and at shave ice stands and golf courses and fancy restaurants right here in the 50th State. YOU STEPPED UP : In late 2015, HIRA's Facebook page was absolutely FLOODED with suggestions from folks throughout the islands. From those dozens and dozens of contributions, the top nominations were narrowed down to twenty ideas which could best honor the informed and insightful opinion that Republicans really have of our 44th president. 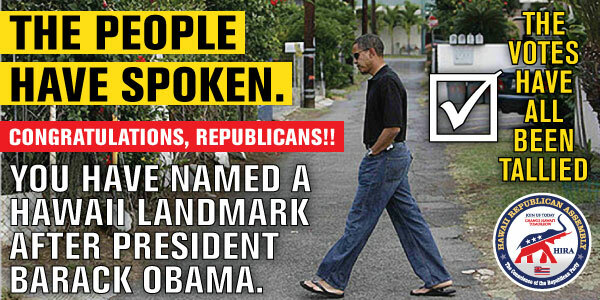 PREPARE FOR THE DRUM ROLL : Unlike Democrats, Republicans in Hawaii really want to seriously honor Obama. BUT, as you know, there are two types of Republicans in the Aloha State. There are those who love Obama so much that they'll waste hundreds of millions of your tax dollars to pay homage to the most liberal president in recent history by voting for Obamacare. 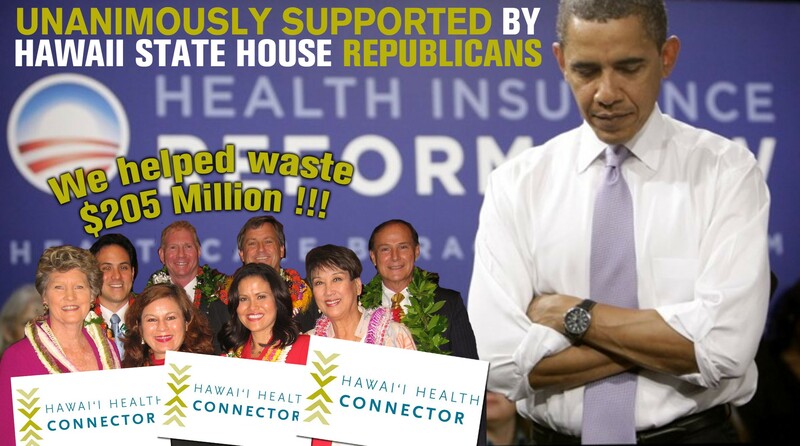 You remember, how Barack and his Obamacare lobbying team suckered local RINO politicians Gene Ward , Cynthia Thielen , Kym Pine , Barbara Marumoto and others to approve and implement the massively expensive and failed Obamacare exchange (the "Hawaii Connector") right here in Hawaii. Well, these wasters of $205 million did NOT get to vote in HIRA's survey. Then there's the other type of Republican -- the serious kind who knows a progressive politician with failed socialist policies when they see one. The kind of Republican like you who knows that our state GOP is controlled by RINO's who didn't lift a finger to fight Obama's destructive policies during the past eight years, let alone Abercrombie's or Ige's. Those are the brave conservatives who helped HIRA determine how Obama should be honored; those who were willing to agonize over what landmark in Hawaii should be named after the president from Hawaii known for wearing 'mom jeans' and 'flip flops' during his down time. 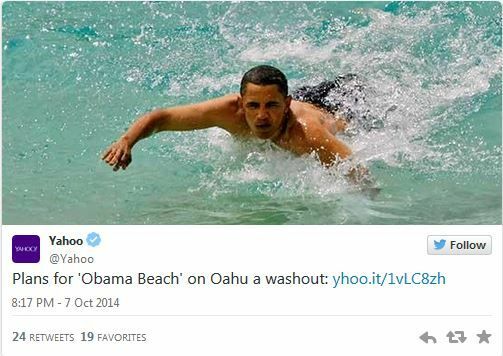 It was in that spirit that we turned to you 12 months ago to begin suggesting and voting on the best thing here in Hawaii to name after Barack Hussein Obama. THE ENVELOPE, PLEASE : And the winning entry is . . . Yes, a whopping 25% of Republicans who participated in HIRA's survey decided to honor Obama by selecting a local sewage treatment plant from the final list of 20 nominees. FULL DISCLOSURE : Here's how the full voting broke down. OBAMA + SEWAGE : It's the kind of fitting monument to Obama which people will actually think about several times a day! 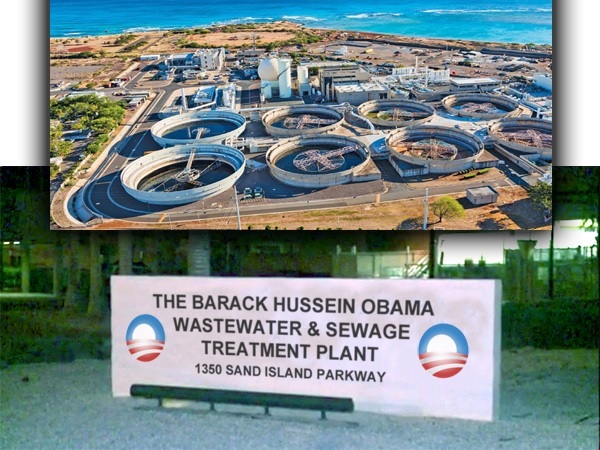 Given the Democrat Party's sorry, yet predictably terrible record of sewage spills , broken promises, cost overruns , dumping raw sewage into the Ala Wai Canal, it seems perfectly fitting that Hawaii Republicans named a sewage treatment plant after Hawaii's favorite Democrat, Barack Hussein Obama. Moreover, Republicans have a great sense of humor, as they clearly recall the irony of Obama's EPA having to order Democrat Mufi Hannemann to stop allowing Oahu's sewer system to disintegrate like the rest of our neglected infrastructure; an order which led directly to a massive increase in sewer fees to homeowners to finance the decades of Democrat neglect. CARRYING THE TORCH : With her traitorous record for financially and politically supporting Democrats over losing Republicans in 2016 , HIRA nominates the consumate Republican backstabber, PRP's most willing puppet, Kirk Caldwell's biggest cheerleader and West Oahu city councilmember Kymberly Pine-Ryglowski to introduce the formal landmark "renaming" resolution at Honolulu Hale so that her fellow Democrats on the City Council -- as well as Pine's endorsed candidate for mayor, Kirk Caldwell -- can approve the name change: "The Barack Hussein Obama Wastewater & Sewage Treatment Plant" on Sand Island. As a supporter of Obamacare and the wasted $205 million (not to mention the City's heavy rail project and higher taxes) , Pine is the perfect choice. MAHALO : Thanks again to all of you that voted during 2016. By selecting a monument, you brought lasting honor upon the co-founder of Punahou's infamous "Choom Gang", the star pupil of Saul Alinsky's Rules for Radicals, the good buddy of terrorist Bill Ayers, and Chicago's smooth-talking socialist community organizer who set out to transform our nation. 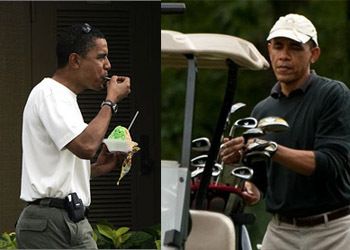 Tonight, the Obama's leave Hawaii and head back to the White House to start packing their belongings, continue pardoning criminals (Hillary too? ), and creating messes for Trump to clean up. Hawaii's Republicans will never forget Obama's eight crappy years in office and have found the perfect way to remember his legacy. Aloha 'oe and Hauoli Makahiki Hou 2017. P.S. In 2017, it's time to give state and local Democrats and their liberal media cheerleaders something to get upset about -- and you CAN by supporting HIRA Action with your donation of $20 or more today. Mahalo!